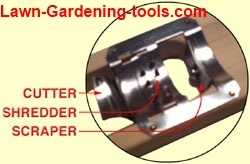 Made of wood and strong stainless steel components, you won't have to worry about plastic parts of flimsy blades breaking like the terrible imitations. The blade of the Lee's Corn Cutter is adjustable to accommodate your needs whether you prefer whole kernel or cream-style corn. You can choose to alter the cutting edges to change the size of your kernels for whole kernel corn. Adjust the cutting edges for cream-style to cut the kernel completely off and to release the juice within the kernels. Lee's Corn Cutter is 17" so that the whole ear can be guided to pass through the cutting mechanism. 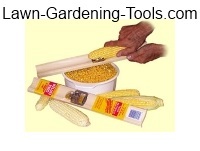 You won't regret buying one or more of this proven corn cutter, and it will last you for years to come.